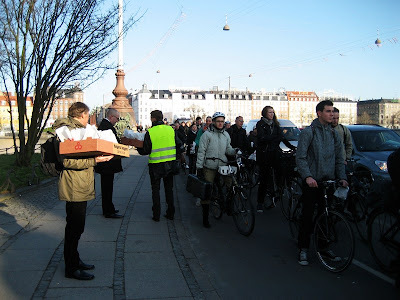 This morning was the launch of the annual We Cycle to Work [Vi cykler til arbejde] campaign in Denmark. 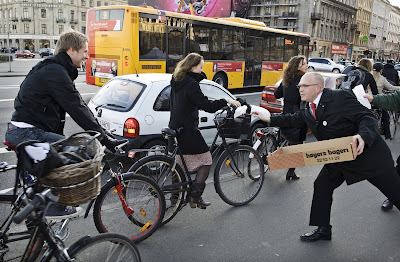 Here we have the Vice Mayor of Copennhagen, Klaus Bondam, handing out morning rolls to some of the 20,000 cyclists that pedal past on this stretch of road each day. He's the man in charge of traffic and the environment and we've posted about him before. It's all low-maintenence. All you do is ride your bike to work, which many people do anyway. 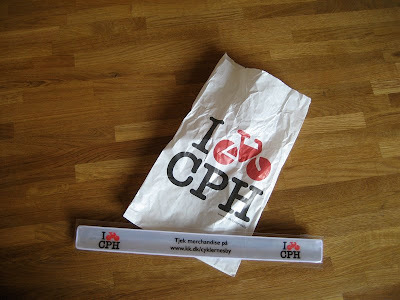 I used to take part each year when I worked at Danish Broadcasting Corp. Between 90,000 and 105,000 people take part each year across the Kingdom.